Now that it is so cold, it’s important that we take good care of our skin! I also notice that during the winter my skin is so dry and I need a good oil to take care of it. But an oil leaves a greasy film…. 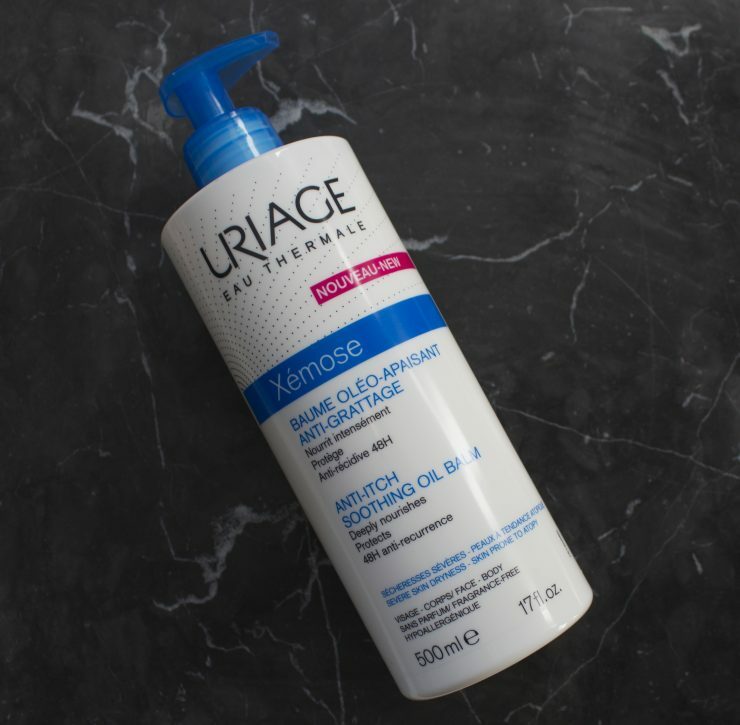 But from Uriage I got a while ago an oil balm to try out. And maybe you already now this brand from my review from the amazing thermal micellar water. But this time I’m going to tell you all about this oil balm. Curious or this is the perfect solution for my dry skin in the winter? This oil balm is for body and face. I only tested this out on my body. Because I thought that I otherwise would get acne. But of course if you have a dry/sensitive skin, you can always use it also for your face. I find the packing so handy! It’s a big flagon but the pomp system really works amazing! It’s so easy to pomp the oil balm out of it. So from me the packing get a big 10 and some extra plus point because of this way to handy packing! The flagon contains 500ml, so you can do a long time with this flagon. Especially if you keep in mind that the most regular body lotions only contain 100ml till 250ml. You already know that I find the packing so handy. But what do I find from the oil balm itself? Ok, I find this the best product for my skin I ever tried! I never thought that I would say that, but it’s just the truth! This oil balm is an amazing product! Ok, it doesn’t have a special smell or packing. But it does absorbs very quickly into my skin. And it takes amazing care of my skin, it makes it so soft and hydrates it. It’s just an amazing product! And after hydrating my skin I can directly put my clothing on without any problems. This is not a fancy body product, but it is really amazing! So do you have a dry skin or do you wanna take extra care of your skin (during the winter)? Then is this the perfect product for you! Prize: the prize is hard to find… But it depends from pharmacy till pharmacy and you also find it online… But the prizes that I found where around €19 till €24,95. So I think that the prize is between that for a big flagon from 500ml. Ik ben nu wel heel erg benieuwd! Zouden ze ook vegan zijn?